Siberian Huskies are a beloved dog breed that's known for their distinct wolf-like appearance. They were originally bred to carry humans and cargo over long distances in Arctic environments. You can still find faithful Huskies doing the same job as their ancestors. However, for the most part, modern Huskies are just another member of the family. While Huskies can live like other domesticated canines, they have special characteristics that set them apart from other dogs. In addition to needing plenty of opportunities to get exercise, Huskies have unique dietary needs and unusual eating habits. Their long history of living in harsh environments has changed their relationship with food. As a result, you'll have to be extra vigilant in planning their diet. How Much Food Does a Husky Need Per Day? One of the biggest mistakes that new Huskie owners make is feeding their pup too much food. It's very easy to make that mistake if you base your decisions on size alone. Huskies are known for being very active and lean. Normally, an active dog would need more calories to keep up. However, Huskies are different. When they were working in the barren environments of the Arctic, food was scarce. They had to make the little food they did get last. Their bodies adapted over time. While adult Huskies can weigh anywhere between 50 and 60 pounds as a fully-grown adult, they don't need nearly as much food as other dogs of the same size. On average, a healthy adult Husky will only need about 1,100 calories every day. The exact amount of food you should provide will vary on a number of factors. ​Every dog is different, so you should monitor your dog's overall health and adjust accordingly. Some considerations include age, activity level, and body condition. Body condition refers to the overall state of their body. Veterinarians use a grading system to determine how overweight or underweight your dog is. You can consult with your vet to get a better understanding of what type of adjustments you should make. When it comes to age, it's important that you make calorie adjustments through various life stages. Most senior dogs will do better on as little as 900 calories each day. The same goes for inactive dogs. If your dog spends most of his or her day lounging around, they're likely experiencing a dip in metabolism. You'll need to adjust their diet to avoid weight gain. 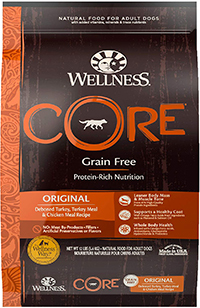 This kibble from Wellness Core is made of high-quality ingredients that your Husky can benefit from. The first ingredient listed is deboned turkey. Protein makes up an impressive 34% or the recipe so that your dog's muscles stay strong and healthy. There are no grains in this product. Instead, you'll find probiotics, omega fatty acids, and plenty of nutrients. Plant-based ingredients like spinach, carrots, and apples are included. they're chock-full of essential vitamins and nutrients that your dog needs to thrive. The kibble is also made for easy digestion. It has healthy probiotics but no artificial preservatives and flavors. 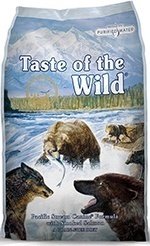 Taste of the Wild has a great reputation for creating high-quality dog foods that imitate the diet of wild canines. This Pacific Stream formula is a great option for Huskies. It has a number of different fishes listed as the protein source. Not only does this provide a complex amino acid profile, but it also ensures that your dog is getting plenty of omega fatty acids into their diet. Salmon is used as the primary protein. In total, protein makes up about 32% of the recipe. Additional ingredients include tomatoes and berries. They provide plenty of vitamins and have beneficial antioxidants that can improve your dog's immune system. 24% of the recipe is comprised of protein. Most of that comes from chicken meal. Complex carbohydrates like peas, flaxseed, and whole brown rice are also used. They can help to regulate your dog's blood sugar levels and avoid energy crashes. 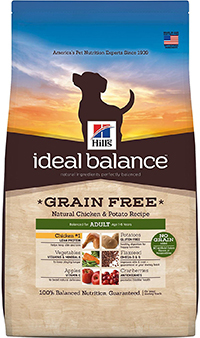 Hill's Ideal Balance uses nearly 50 ingredients to ensure that your dog is getting the balanced diet that they need. This formula is filled to the brim with beneficial protein sources, fruits, and vegetables. Chicken is the main ingredient. This is followed by potatoes, flaxseed, peas, dried beet pulp, and much more. Apples and cranberries are also added as a source of antioxidants. Overall, the blend of ingredients can strengthen your dog's immune system and make sure that they have plenty of fuel to stay active. 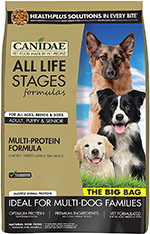 This food from Canidae can benefit your dog throughout his or her entire life. It's designed to provide balanced nutrition. About 24% of the kibble is made up of protein. 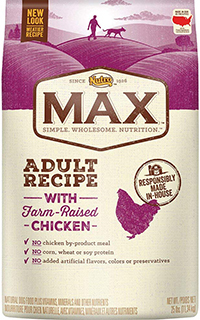 This comes from high-quality sources like chicken meal, turkey meal, and lamb meal. Oceanfish and salmon oil are also added for extra benefits. 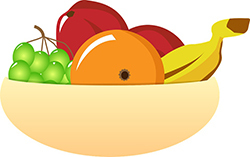 Vitamins and minerals are also included through high-quality fruits like cranberries as well as supplements. To support your dog's joints as they age, the manufacturers threw in glucosamine and chondroitin. One great thing about Huskies is that they tend to regulate their food intake on their own. While other dogs will scarf down every last bit of kibble you put in front of them, Huskies tend to be more selective in how and what they eat. Your dog will decide how much they want to eat based on their needs and activity. It's not uncommon for Huskies to leave some food behind if they have not gotten enough exercise that day. In some cases, your dog may even skip a meal altogether. When your dog does this, it's important that you don't force them to eat more than they want to. You should also avoid trying to make up the difference the next day. If your pup skips a meal, don't add any more kibble on the following meal. Free feeding refers to leaving food out for your dog to eat as they please. Generally, this is frowned upon within the dog community because it can lead to overeating and excessive weight gain. 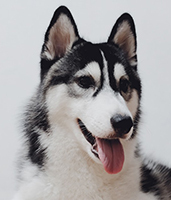 While you may think that it's alright to do so with a Husky because of their self-regulating nature, you may want to give it a second thought. In addition to being able to keep up their diets on their own, Huskies are notoriously stubborn. They're free thinkers and like to make decisions on their own. This independence can make them incredibly picky when it comes to food. These dogs frequently get bored with substandard kibble or old food. Many Huskies will not even go near a bowl if it's been sitting out for a few hours. To avoid any issues, it's good to create a feeding schedule that you and your pup can stick to. At the very minimum, you should split up their daily calories into two meals. However, many Husky owners prefer to feed three meals. While it may seem that Husky's aren't susceptible to weight gain, this is not true. Even the most self-regulating pup will start to ease up on their own restrictions after a while. This typically occurs once your dog gets a bit older and lazier. When this happens, you need to make sure that you're not overfeeding your pup. You'll need to keep track of their weight and consult with your veterinarian to ensure that they stay within a healthy weight range. It's easy for your dog to gain weight if they have the means to do so. However, losing weight is another story. Huskies have a particularly difficult time getting rid of extra pounds. It's best to avoid weight gain altogether so that your canine companion can stay healthy. Because Huskies eat less food than most dogs of their size, the quality of the food they eat is more important than ever. You'll need to sift through the wide variety of dog food options and find a suitable formula that's healthy, delicious, and easy to consume. Protein is the most important thing that your Husky needs. Protein is vital for developing strong muscles. It's recommended that a Husky's diet is made up of around 25% protein. However, many owners try to find dog food recipes that contain upwards of 40%. You should look out for high-quality protein sources like chicken, turkey, lamb, beef, or fish. Wholesome animal meats are always preferred. Certain organs are also beneficial. The meat should be listed first on the ingredients list. This indicates that it's the most prevalent ingredient in the formula. There are a number of protein sources out there. 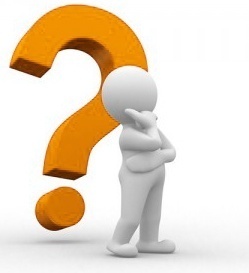 You may come across ingredients like chicken meal or turkey meal. These are perfectly fine as long as the specific animal is identified. You should always avoid mystery meat meals and byproducts. In the wild, Huskies don't need carbohydrates. Most of these canines rely purely on animal protein to survive. With that being said, you'll be hard-pressed to find a dry kibble that doesn't contain any carbohydrates. Most manufacturers include some form of carbohydrates to make the food more filling for your pup. When you're shopping for the right dog food, stick with options that utilize complex carbs. These include ingredients like sweet potatoes, peas, and beans. Complex carbohydrates are easier to digest than cheaper alternatives. They also absorb into your dog's body slowly throughout the day. This can help keep their metabolism up and avoid any energy crashes. Good fats like salmon or flaxseed oil are very beneficial. These fats contain Omega Fatty Acids. They work to improve the immune system and enhance overall cardiovascular health. They're especially useful to Huskies because they can also keep the skin and coat healthy. Huskies are prone to a number of uncomfortable skin conditions. Some healthy fats can keep the skin moisturized. Your dog will need a healthy dose of vitamins and minerals to stay healthy. Most of them will come from a formula's plant-based ingredients. Fruit and vegetables are a great addition to any recipe. Look out for a dog food that has a large blend of ingredients. Carrots are great for beta-carotene, which helps to improve ocular health. Vitamin E is found in antioxidants like blueberries and raspberries. This vitamin can help maintain your dog's coat. Beans and certain types of nuts contain zinc, which can help improve the quality of your dog's blood. A healthy amount of zinc can prevent issues like dermatitis. Calcium and phosphorous are also beneficial. They can strengthen the bones and make sure that your dog's skeletal system develops properly. Needless to say, vitamins and minerals are an essential part of your dog's diet. Keep this in mind when you're shopping for the right food. 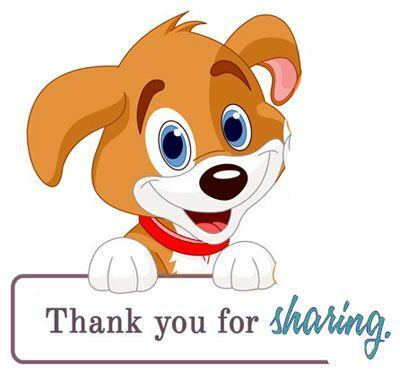 Every dog is at risk of experiencing health problems at some point in their life. Huskies are no different. Despite the breed's reputation for good health, there are a few issues that Huskies are genetically predisposed to. Luckily, you may be able to keep these problems under control with a good diet. Joint issues are far too common with Huskies. These dogs spend most of their time getting exercise. As a result, their joints are put under significant stress. Hip Dysplasia is an issue that develops as your dog is growing up. The hip joints can become malformed due to a lack of proper nutrition. Arthritis can occur throughout their body. You may even be able to see inflamed joints through their fur and skin. To alleviate joint issues, you can find a formula that contains glucosamine and chondroitin. Cataracts is an eye issue that can result in significant vision loss. Your dog's eye can become cloudy over time. Huskies are known to suffer from Cataracts as early as 6 months of age. Providing your dog with a healthy dose of beta-carotene may help to prevent cataracts or slow down its progression. Carrots, spinach, kale, and sweet potatoes all contain beta-carotene. Despite having a thick protective coat of fur, Huskies are predisposed to suffering from a range of skin conditions. Their skin can become dry and flaky. They may even develop itchy hot spots that cause them to rip their fur out. It's important that you provide your dog with food that's capable of keeping their skin and fur moisturized. Omega fatty acids can do wonders to keep their signature coats shiny and brilliant. 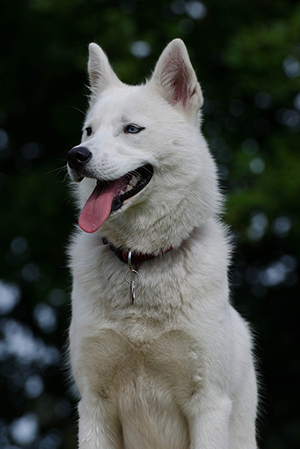 Also Read: Husky Mixed Dog Breed: The Goberian ..